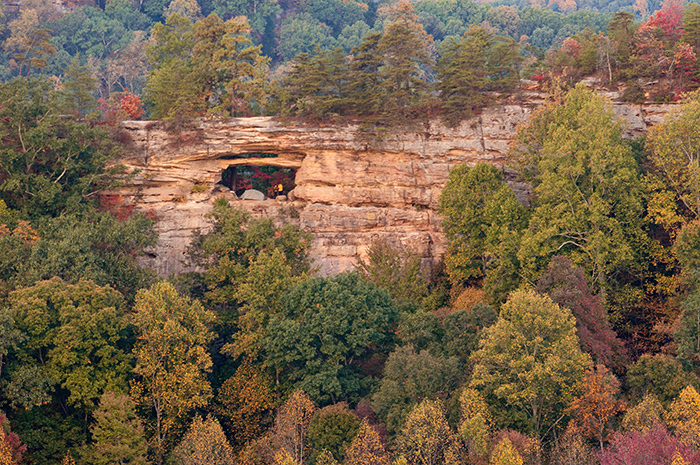 Viewed from the Auxier Ridge Trail, Double Arch is a highlight of the Red River Gorge. Draped in early autumn foliage it makes for a pleasing photo op. It is also a "highlight" destination for hikers looking for a place to overnight in the Gorge. Camping under any of these arches or rock shelters, however, is not allowed by the foresrty service. Many choose to ignore this and risk the consequences like the campers here.